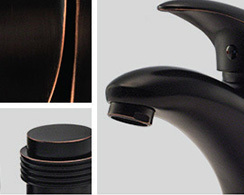 The selection of metallic finishes available on MR Direct faucets has just been expanded. With the recent introduction of our new antique bronze coloring, consumers will have the opportunity to go to the dark side when visualizing their bathroom decor. In stark contrast to the ever-popular bright chrome coating, antique bronze flaunts a profound, dark chocolate finish which nearly approaches black. Thin, copper-colored highlights on select edges create a glamourous appearance suggestive of classic eras long since gone. For a distinctive difference in your bath, consider this new dark alternative, but remember we continue to offer our beautiful, brushed nickel, chrome and oil-rubbed bronze finishes as well.